Looking for some FREE family fun next Friday night in Tampa Bay? 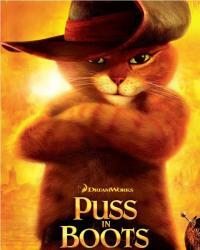 Screen on the Green, the popular, FREE movie series held in Curtis Hixon Waterfront Park, will be showing the family, favorite Puss in Boots on Friday, December 28 at 7 p.m.
Puss in Boots (2011) follows the character Puss on his adventures before his first appearance in Shrek 2 in 2004. Accompanied by his sidekicks, Humpty Dumpty and Kitty Softpaws, Puss is pitted against Jack and Jill, two murderous outlaws in ownership of legendary magical beans which lead to great fortune. "Screen on the Green Movies in the Park provide families the opportunity to explore downtown and enjoy a movie together," said Kitty Lyons, Executive Director of the Friends of Tampa Recreation, Inc. sponsor of the movie series. "We believe the movies, along with Tampa&apos;s Downtown on Ice, are family-friendly activities that complements the continued growth and vitality of downtown." Concessions will be available in the park. Blankets, low chairs, coolers and well behaved dogs on leashes are permitted. 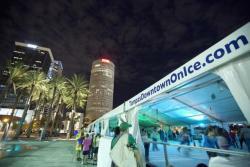 More family fun that is not free but very afortable for the family is Tampa&apos;s Downtown on Ice, the Bay area&apos;s only outdoor ice skating rink, is open until 10 p.m. Skating is $10 for 90 minutes and includes skate rental. Stay tuned for more family fun activities to do in Tampa Bay!